Pre-loaded with the highly concentrated all-in-ONE 4 Enzyme Detergent Endoscope Cleaners. Tubular, Multi-Use, Sponge, Loaded with highly concentrated all-in-ONE Enzyme Detergent endoscope cleaners. Sponges are available preloaded with endoscope enzyme detergent cleaners and offer an additional margin of Safety when Cleaning Contaminated Instruments. Endoscope enzyme detergent cleaners with highly concentrated cleaning power that deliver non-irritating endoscope enzyme detergent cleaners, neutral pH endoscope enzyme detergent cleaner surfactants, non hazardous enzyme detergent cleaning outcomes, and endoscope enzyme detergent cleaners that are biodegradable. 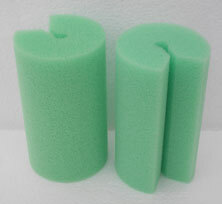 Sponges, Surgical Instrument Cleaning Sponges, Endoscope Cleaning Sponges, cut cleaning costs. Surgical Instrument Cleaning Sponges clean fast Endoscope Cleaning Sponges preloaded with concentrated Endoscope Enzyme Detergent Cleaners guaranteed. The Enzyme Detergent Endoscope Cleaning Sponges retain more enzyme detergent than other cleaning sponges and paper based wipes. The all-in-ONE four enzyme detergent cleaner is over four times more effective than other enzyme solutions, delivering the four Enzyme Detergents: Protease endoscope enzyme detergent cleaners, Amylase endoscope enzyme detergent cleaners, Carbohydrase endoscope enzyme detergent cleaners, and Lipase endoscope enzyme detergent cleaners that are needed to breakdown all forms of proteinaceous bioburden plus the surface Endoscope cleaning Detergents needed for rapid and effective cleaning. Contact us for surgical instrument detergents and enzyme surgical instrument detergents.